The smaller host is a skyray I bought from Rich ( Lifetime17 ) he made the pretty heat sink with the copper insert, he also made an adjuster but I like seeing the copper insert, it holds a 100mw osram 520, the larger MX-900 I have literally dozens of and I can build in minutes, they are ultra simple with ample room to work, it holds the NDG7475 running an 1.8a X-drive. I had to go out and eat some dinner, just got back and put it together, it was in my mailbox today at 6pm, the MX-900 is a very easy build. BTW: The osram has a 3 element 520 lens and the MX-900 has a 2 element 520 lens, I'm not sure what difference it makes, I may swap them and see although I typically don't replace a lens unless it's burnt or too dirty to clean if I can help it, the less we expose our diodes window the better. @ Paul: Sorry I don't have a power reading, I still don't have a LPM, I fully intend to PBS cube 2 x NUBM44-81's or what ever comes next, I want to be able to read double digit wattage, hopefully triple digit wattage before all that long. I like pretty beams, DPSS are the best to look at and I can enjoy 100mw as much as 1000mw as for pointing, it's subjective, if you pick up a 5mw it is cool and fun, but pick up 100mw and the 5mw looks weak, but pick up the 5mw later and it's fun again. Hey Red....nice work. How much does that MX 900 cost by the way. I was out the same time you were experimenting with my new 1 W green in the 10 X jetlaser BE....man, I really love that green! But....if only we could converge 50 NUBM44s that would be one burning mother of all burners! Keep on lasing brother! I haven't seen any MX-900's for sale lately, they were going for 10 dollars or so for the flashlight. I often use a lens flare hider to cut down on the wide angle of lens flare, just a rolled up tube of thick black cardstock paper, but sometimes I also use a blank module with the back drilled out and a piece of black cardstock inserted to soak up overspray, it makes for a nice clean beam. I set the lens to a perfect infinity focus and lock it down with the copper end then screw on the aluminum can, if you leave room you can losen your set screw and push it back so it sits flush. The glow is from the spot reflecting back, but the bulk of the wide angle flare is gone. What a score, all 3 for $134:can: and looking like they are new, plus a true NDG7475 and not the NDG700..Don't get me wrong the NDG700 is plenty and probably my next purchase. My M02 at 1.8A is pretty much untolerable looking at the dot at 15 or 20 ft. inside. I don't bring it out at night as it's in Star Trek phaser and would bring all kinds of attention but the next 1W green will be in host. Dtr. is now down to $120 for the N520 but still don't to much on these new N diode's? Here is the output of a 7475 with a 3E and a G2 set to DTR driver specs i think he sets them at 2.2A and uses a black Bluck driver. So swapping the G2 for a 3-element resulted in roughly a 23.5 % reduction in optical output. p.s. If the diode were a NDG-700 then at 1.8a DTR's image shows 1026mw with a G2 so it would be reduced to roughly 785mw by switching to a 3-element. My power supply shows 1.7a @ 4.5v suggesting it is the more efficient 7475 rather than the 700 diode as DTR's readings were 4.7 vs. 4.8 volts at 1.7a with the NDG7475 being the more efficient diode, it's a small point but I am on the more efficient side, however I think I will stay at 1.8a and enjoy a longer lifespan, I may very well get another 7475 later and run it at 2.2a and see if the observed output looks much different, also I just didn't like the look of the G2 lens, the beam was thinner to start but not as attractive somehow and the far field line was much wider, I would only use a G2 on this diode if it was employed along with cylindrical correction. Anytime enjoy this diode I have never had any issues with this in my personal builds. To this day all my 7474’s and 700’s are still kicking and I had them for quite a few years now. Redcowboy, at the same time you were having fun with green, I received my goodie package from Lifetime17 AKA, Richard. 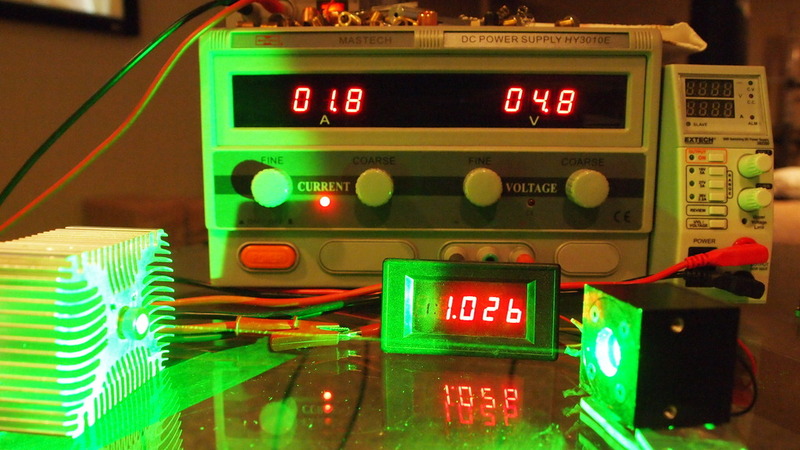 Below you can see the final result of Jayrob's mod of a 2 D cell Maglite with battery management, Lifetime17s contribution of the heat sink and adapter for the 10X Jetlaser BE which I purchased really just to give me a wide path of green. Hidden in its bowels are DTRs NGD7475, boost driver, module, and 2 element lens. My old acquaintance, the shock jock, Greasman, would say that this looked like groinacological device! 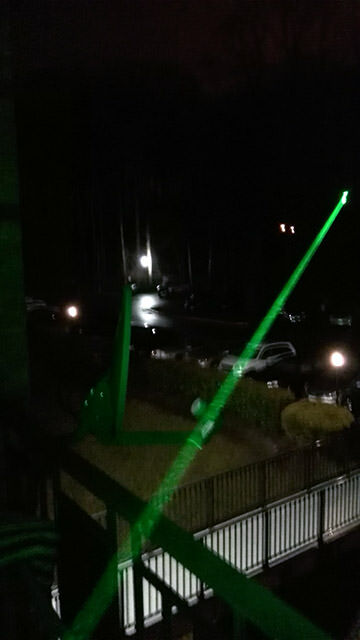 As for the following beam shots....quite a bit of trial and error. Ultimately I found using a 2 element. To achieve these beams, I simply rotated the lens, put the adapter on, and saw the result. I kept changing the focus until O achieved the result I wanted. I did not correlate it with focus at a particular set distance. While the photos do not capture the scintillations of the beams, what they do show unintentionally, is a slight exaggeration of the magnitude of the beam's appearance. That said, we are talking about one thick beam of green! I did find you could get all sorts of strange things making the beam expand then contract....this is the first time I really had a chance to experiment with a BE which is exactly what I was trying to achieve. In no particular order of appearance, for all their help my thanks to Lifetime17 who really did a great job making the jetlaser adapter and heatsink. Jayrob for his heatsink. 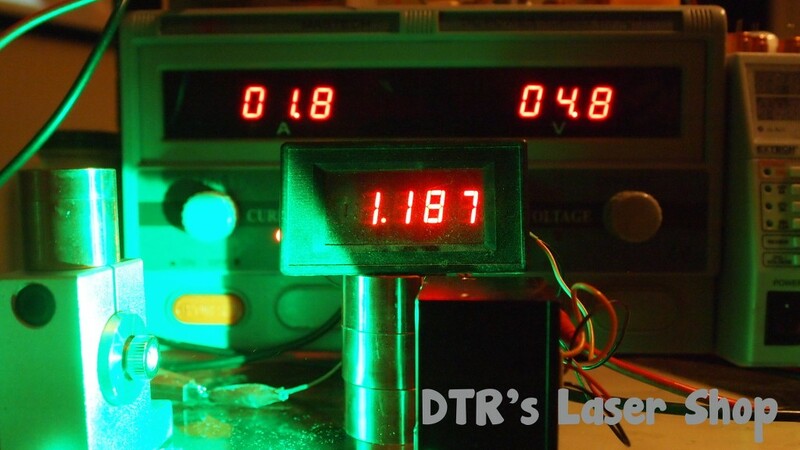 DTR for providing the diode and driver. Also thanks to Redcowboy for offering his experience and expertise in making BE setups. For those who are new to the Forum, there is a tremendous amount of knowledge and experience here. 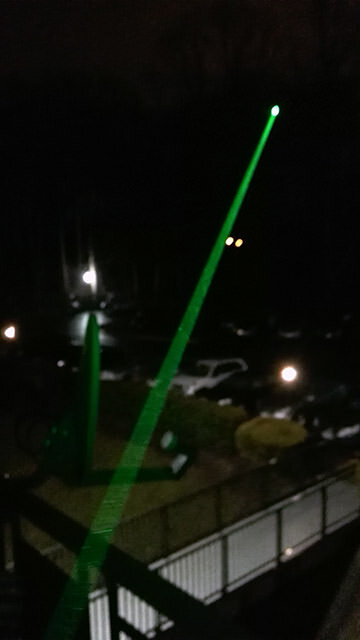 With time and patience you can put together your own lasers. Like it, that green sure is wonderful with some power and low divergence. Edit; just curious, how far away was the dot?